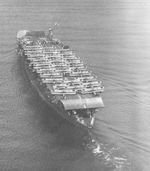 Akagi was the queen of Japanese flattops, the flagship of First Air Fleet. A conversion from a battlecruiser hull (much like her contemporaries, the U.S. Lexington-class carriers), she still possessed the lean lines of her original design. She was scuppered at Midway. Dimensions 855'3" x 102'9" x 28'7"